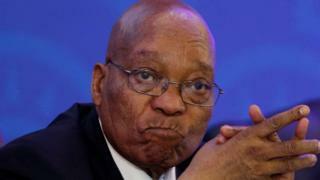 South Africa's ruling party has called a meeting of its top body for Wednesday, amid growing pressure on President Jacob Zuma to stand down. In a statement, the ANC said the meeting would discuss the "management of the transition" between the Zuma administration and the next one. On Monday, senior politicians held an emergency meeting in Johannesburg to discuss Mr Zuma's future. The president has resisted calls to quit over corruption allegations. Mr Zuma, 75, was replaced as party leader by his deputy, Cyril Ramaphosa, 65, in December. Mr Ramaphosa is now the front-runner to succeed him as president. An ANC spokeswoman told Reuters news agency that the removal of President Zuma was not on the agenda at Monday's meeting. The president, in power since 2009, is due to make a state of the nation address on Thursday, and some in the party want Mr Zuma to leave office ahead of that speech. On Wednesday the ANC's National Executive Committee will meet. If the committee agrees to recall Mr Zuma, the BBC's Andrew Harding says, it would be very hard for him to resist. He might even face a no-confidence motion in parliament the next day, our correspondent adds. Will Zuma be ousted as South Africa's president? Mr Zuma, who spent time in prison for his part in the fight against apartheid, met the ANC's top six on Sunday. They are said to have failed to convince him to stand aside. Julius Malema, an opposition leader and former ANC member, said on Twitter that Mr Zuma had refused to go early. Other unconfirmed reports from Sunday's meeting say that Mr Zuma asked for protection from prosecution for himself and his family. Why does the ANC want to remove him? Mr Zuma's presidency has been overshadowed by allegations of corruption. In recent years his links to the wealthy India-born Gupta family, who are alleged to have influenced the government through their relationship with Mr Zuma, have caused his popularity to plummet. In South Africa, it has become known as "state capture". Both Mr Zuma and the Guptas deny the allegations. Then there is also the country's struggling economy, with the unemployment rate rising to about 28%. 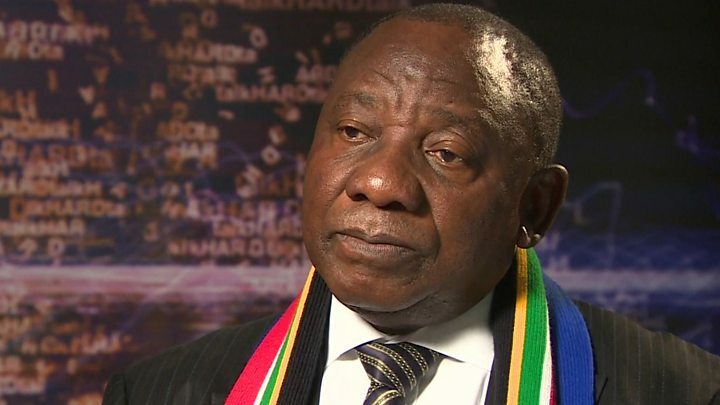 Media captionCyril Ramaphosa recently told the BBC's Zeinab Badawi that Jacob Zuma was "feeling anxious"
As a result, many in the ANC fear his presidency has become toxic - and is hurting the party's standing. That appeared to be borne out at the 2016 local elections, when the ANC lost ground to the opposition Democratic Alliance (DA) and Economic Freedom Fighters (EFF). With a general election set for 2019, the ANC will be keen to distance itself from any more negative press - and therefore it is perhaps not surprising that Mr Ramaphosa was elected the party leader on an anti-corruption platform. However, Mr Zuma still has his supporters within the ANC - including at least two of the top six - so nothing is definite. 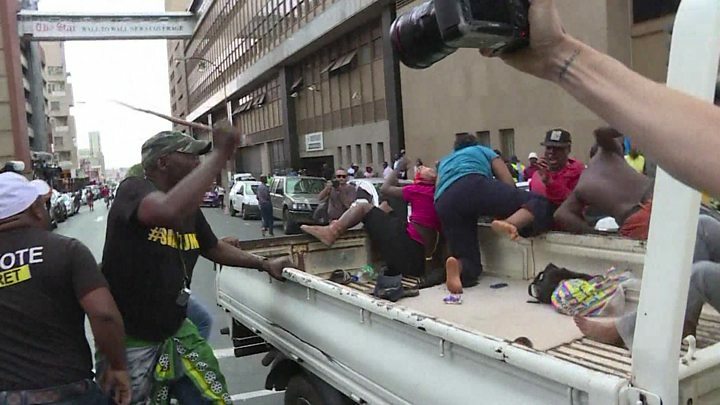 On Monday, there were scuffles out the ANC headquarters between small groups of pro- and anti-Zuma supporters. What are the allegations against him? Will Zuma be ousted as president? Video Jacob Zuma and the ANC: Are South Africa's dreams of freedom dead?